A 69-year-old male patient, with bilateral hypoacusia and tinnitus, had a diagnosis of left vestibular schwannoma with synchronous meningioma on the left frontal lobe. After partial surgical resection of the acoustic schwannoma, this was followed by stereotactic radiosurgery on the residual lesion. The patient had a metachronous prostate cancer treated with conformal radiotherapy associated to 6 months of hormone therapy with luteinizing hormone/releasing hormone analog. During follow-up, prostate-specific antigen value increased to 0.27 ng/mL and the patient underwent 18F-methylcholine positron emission tomography/computed tomography (18F-choline PET/CT). The whole-body scan demonstrated a focus of increased uptake at level of the left cerebellopontine angle and at the left frontal lobe, corresponding to the known vestibular schwannoma and meningioma. A subsequent brain contrast-enhanced magnetic resonance imaging (MRI) showed an increased dimension of the left cerebellopontine neuroma and dimensional stability of the left frontal meningioma compared with previous MRI of 6 months earlier. To the best of our knowledge, we describe the first case of a 18F-choline PET/CT demonstrating a relapse of a vestibular schwannoma after stereotactic radiotherapy. In May 2012, a 69-year-old male patient, with a medical history of bilateral hypoacusia and tinnitus, had a contrast-enhanced magnetic resonance imaging (MRI) diagnosis of left vestibular schwannoma with synchronous meningioma on the left frontal lobe. After 6 months, due to the worsening of symptoms, the patient underwent a partial surgical resection of the acoustic neuroma, whose cellular architecture was classified as “Antoni B” pattern, followed by stereotactic radiosurgery on the remnant (planning target volume [PTV], 6.7 cm3 covered with a margin dose of 12 Gy). During that time, the patient, also, had a metachronous prostate cancer (cT2cN0cM0, Gleason score of 4 + 3 and prostate-specific antigen [PSA] of 9 ng/mL) treated with a conformal radiotherapy associated to 6 months of hormone therapy with luteinizing hormone/releasing hormone analog. In January 2017, during follow-up, PSA increased to 0.27 ng/mL and the patient underwent an 18F-methylcholine positron emission tomography/computed tomography (18F-choline PET/CT). The whole-body scan demonstrated increased tracer uptake at level of the left cerebellopontine angle and of the left frontal lobe [Figure 1], corresponding to the known vestibular schwannoma and meningioma (maximum standardized uptake value, respectively, 4.4 and 5.8). A subsequent brain contrast-enhanced MRI showed an increased dimension of the left cerebellopontine schwannoma (25 mm vs. 22 mm) and a dimensional stability of the left frontal meningioma compared with previous MRI dating to 6 months earlier. It is well known that PET-based molecular imaging, as demonstrated with tracers as 11-C methionine, may contribute to the evaluation, treatment planning, and follow-up of patients with skull base meningiomas and schwannoma. In a recent review, Calabria et al. underlined the potential role of choline metabolism PET tracers in the detection of benign and malignant brain tumors. Recently, Malamitsi et al. described as an incidental findings on 18F-choline PET/CT of an acoustic schwannoma. To the best of our knowledge, we described the first case of 18F-choline PET\CT uptake in a local recurrence of a vestibular schwannoma after stereotactic radiotherapy. In the era of “Precision Medicine,” it is intriguing the hypothesis that radiolabeled choline, as demonstrated for gliomas, may be considered also in this setting as a biomarker able to predict an aggressive biology of a brain nonmalignant lesion. Nyberg G, Bergström M, Enblad P, Lilja A, Muhr C, Långström B, et al. PET-methionine of skull base neuromas and meningiomas. Acta Otolaryngol 1997;117:482-9. Calabria FF, Barbarisi M, Gangemi V, Grillea G, Cascini GL. 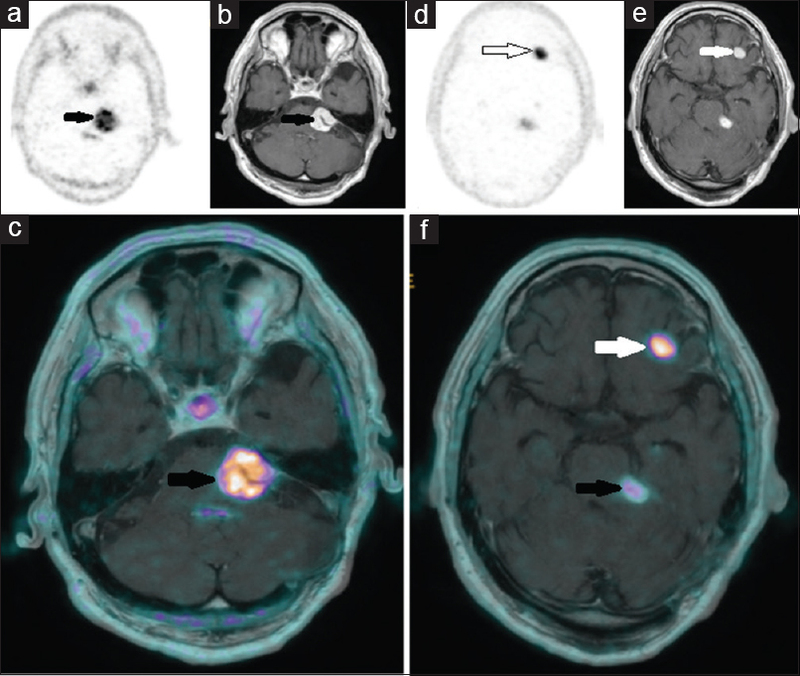 Molecular imaging of brain tumors with radiolabeled choline PET. Neurosurg Rev 2018;41:67-76. Malamitsi J, Efthymiadou R, Pipikos T, Vlachou F, Prassopoulos V. Internal auditory canal tumor as an incidental finding on a choline PET/CT scan in a prostate cancer patient. Clin Nucl Med 2017;42:e513-5. Takenaka S, Asano Y, Shinoda J, Nomura Y, Yonezawa S, Miwa K, et al. Comparison of (11)C-methionine, (11)C-choline, and (18) F-fluorodeoxyglucose-PET for distinguishing glioma recurrence from radiation necrosis. Neurol Med Chir (Tokyo) 2014;54:280-9.